This weekend I rebuilt the web site I had created about my dad, Frank Larkin. 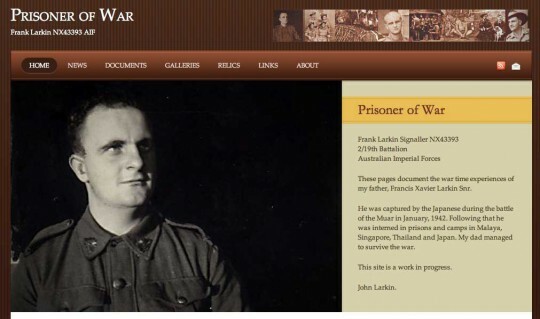 He was a signaller in the 2/19th Battalion, 8th Division, AIF. My father was captured by the Japanese during the Battle of the Muar in January, 1942. He was incarcerated in Malaya, Singapore, Thailand and Japan. He was liberated in August, 1945. In 1993 my father shared a box of belongings that documented his time in the army. I realised that the materials were rich in history and should be shared. I decided that technology was the best way to share the material. Students of history could access the material without the material ever being lost or damaged. This web site is the latest incarnation of that shift to technology. This web site had its origins in an Apple HyperCard stack created in 1993. This stack had comprised an assignment for a subject within the Information Technology programme of the Faculty of Education at the University of Wollongong. Dr John Hedberg, a talented and visionary educational technologist, had guided myself and other students of that cohort in the creation of the HyperCard stacks. Three screens from the HyperCard stack are illustrated below. In 1998 the content that had formed the basis of the HyperCard stack was transferred to the Internet. That site underwent a major upgrade in 2006. 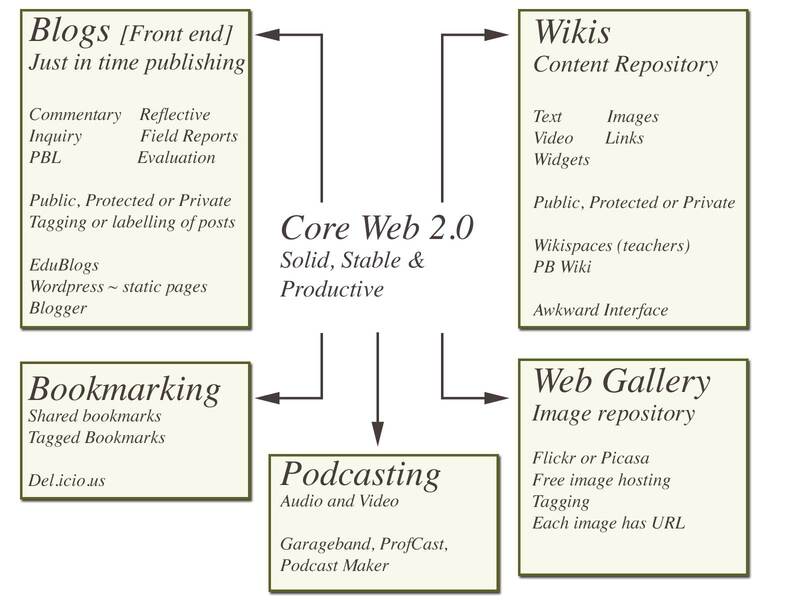 This latest version (2011) incorporates additional photographs and documents that were obtained since the original HyperCard stack was created. Photographs taken in Singapore and Thailand during recent years are also included in the web site. Additional material will be added in the coming weeks and months. I built the new site using WordPress. No more html. This will make updating the web site easy. No more code and no more Dreamweaver. I surprised myself at how quickly I was able to port the content from the old Dreamweaver site to the new WordPress site. I kept all the images on the server in their specific folders and used the excellent Add From Server WordPress plugin to gradually import the images and document scans into each section of the new web site. The most tedious part was adding an “alt” tag to each image. There are a few hundred of them. I like to make sure images have an “alt” tag for accessibility reasons. In order to speed up the construction process I copied plug-ins and settings from this web site to the new POW web site. I am using an identical theme with a different skin. This morning I tidied up the web site and went live. In the coming weeks I will add additional narrative and hyperlinks, particularly within the letters. The amazing thing is that Adele Brice’s grandfather, Charles Edwards, was with my father during that entire period as a prisoner of war. I shall be adding some stories to new web site that Charlie has shared with me in a letter some years back. 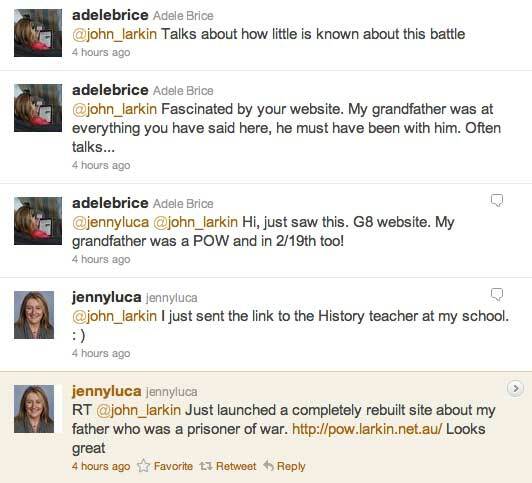 Adele read Jenny Luca’s retweet about my site and she made the connection via input from her husband. This is amazing. Adele and I connected and I could not help but think that her grandfather was Charles Edwards and almost at the same time it came together via Twitter. Her grandad and my dad both both had special jobs for the same prison boss in Japan in 1945 while they were in Ohamma prison. I shall go down to Melbourne too see Adele and her grandad. These connections are so valuable. Thank you all for your sharing. Hope you all find the site interesting and I look forward to reading your stories too. More to come. 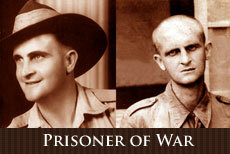 The tribute you have made here is outstanding and is a brilliant way to honor the bravery of these Australian heroes. While going through your website, Adele and I couldn’t believe the connection between your father and her grandfather Charles. We have already been in contact with him, and I am calling past his house to show him your website. He will be amazed at what you have done and will no doubt be very keen to chat/meet with you. 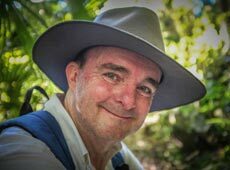 I know Charles has been working hard to record many of his stories and he has many amazing artifacts and maps he has made or kept. This website now has me wondering why we haven’t put his story out there on the web. Students in Year 6 at my school, Ringwood North PS, have for several years now followed the life of Charles as their major Australian History focus. At the end of the unit, they meet him. When he enters the room, you could hear a pin drop. Our Year 6 Graduation Award is now named the ‘Charles Edwards’ award for service to the community. This experience really highlights the amazing power of social media, and how through these networks, human connections can be strengthened. Thank you Adam and a big thank you to Adele as well. I often wondered how Charles was getting on and it is a joy to discover he is still battling along. Amazing. I hope to be able to meet him when I visit Melbourne in July. I once spoke to Charles on the telephone back in 2003. He may not remember. Much has happened in my own life since then. I was living in Singapore at the time. Charles sent me a long letter and a number of maps and drawings showing the locations of prisons and camps. I hope to place some of this material on the newly updated web site. His letter filled in some gaps regarding the experiences of my father as he did not really ever talk about those times. The materials on this web site were unknown to this family until my father shared them with me in 1993. My father visited my school as well back in 1996 and he had the attention of the entire assembly. It has been 10 years since my dad passed away and I miss him. Yes, human connections have been bonded though this medium. It is remarkable. Thank you Adam and thank you Adele and please say cheers to Charles for me. What a rich treasure trove of history you have faithfully preserved here, John– this is stuff that likely would not have seen light of day. This is a model of how it should be done. But more than that, the serendipity of the connection between your Dad and Adele’s grandfather are at the high end of the Amazing stories I have tried to collect. And it might be me, but I do see a striking similarity in the expression on your Dad’s face in the top photo and your own photo. He has much to be proud of, I am sure.